When I reviewed the Lawrence Audio Cello speakers last year, I was so impressed with their physical beauty and world-class sonic performance that I decided to buy them. The Mandolin is the "baby sister" to the Cello. I became curious regarding the performance of the Mandolin, retailing at $5,500 (including the stands), in comparison to its much more expensive and larger sibling. Lawrence Audio, owned by the company's designer Mr. Lawrence Liao, currently has three speakers: the Mandolin, Violin, and Cello. Later this year, Lawrence Audio will be coming out with the new Double Bass, which Mr. Lawrence refers to as the string section of his speaker stable. I believe that great designers have the ability to take the best of their reference-level pieces and bring a lot of that performance to their much less expensive models. Let's see if Mr. Lawrence was able to pull this off in his small two-way stand-mount Mandolin model. • Read more bookshelf speaker reviews from HomeTheaterReview.com's writers. The Mandolins that were sent to me for review were finished in one of the finest piano black lacquer finishes that I have ever seen, regardless of manufacturer or price. Just like the floor-standing Cello, form follows function. By mimicking the shape of a Mandolin, the speaker has a narrow front baffle and no parallel sides to minimize both internal and external diffraction of sound waves. The Mandolin is a stand-mounted two-way design that uses a rear slot port. The stands also follow this design concept and blend perfectly with the lines of the speaker. The Mandolins are directly bolted into the top of the stands for both safety and damping purposes. 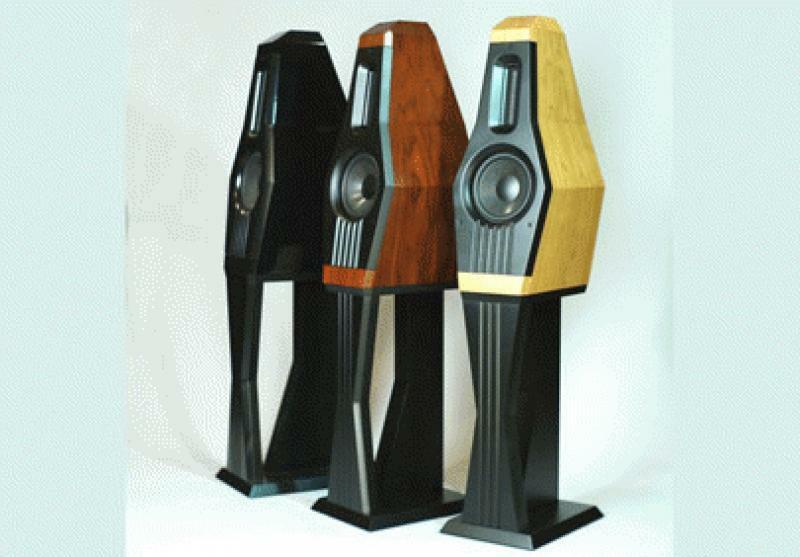 Each speaker weighs 26.5 pounds and measure 22 inches tall by nine inches wide and 11.5 inches deep. The Mandolin's frequency range is 45Hz to 40 KHz. Its sensitivity is 89dB (2.83V/1m). The speaker's impedance is rated at 8 ohms (minimum 6.4 ohms), which makes the Mandolin a very easy speaker to drive, and it uses very high-quality drivers. The tweeter is a five-inch aluminum ribbon and the mid-woofer is a six-and-a-half-inch cone that is composed of non-woven carbon and Kevlar. On the back of each speaker is a single pair of connectors from the highly-regarded brand WBT. Since they have been in my home, one of the first things many of my guests comment on is the appearance of the Mandolins, referring to them as gorgeous pieces of modern art sculpture. I placed the Mandolins four feet from the front wall, six feet apart, and three-and-a-half feet from the side walls in my smaller listening room for optimum performance. Like many reference-level two-way monitor speakers, the Mandolin completely disappeared and created a very large and layered soundstage, with precise location of players in this lifelike acoustic space. Unlike other small monitors that miniaturize the individual players, the Mandolins kept them in realistic proportions on all recordings. What I believe makes the Mandolins very special speakers, along with the Cellos and Violins, was revealed with the first few bars of "You Are So Beautiful" from the classic album John Coltrane and Johnny Hartman (Impulse!). The Mandolin has the transparency of an electrostatic panel, so every micro-detail can be heard in an effortless manner. The speaker gives you the middle of the harmonic, not just the leading edge, so each sound or note has the palpability you hear in live music. The next reference-level trait is the tonality of these speakers. The Mandolin's timbres and tone for vocals and acoustic instruments are as close to natural as I have ever heard in any speaker. Both Coltrane's tenor sax and Hartman's voice effortlessly floated into my room, giving the illusion that they were performing in my listening space. A great album that is considered to contain some of the most important songs in the historical American Songbook is the disc from the Phil Woods Quintet entitled The American Songbook (Kind of Blue Records). When this quintet starts to rev it up on the classic "All the Things You Are," the Mandolins kept their composure and delivered all the dynamics, pace and bite of the music, but never got aggressive regardless of how loud I played this piece. I have therefore concluded that the dynamics and bottom end of the Mandolin can handle big music at realistic volume levels. Finally, I wanted to see how well the Mandolins could do on powerful electric blues and rock music, so I chose a cut from the late, great Chicago blues guitarist and singer Luther Allison's album "Live in Chicago" (Alligator Records). The cut I used was the sizzling "Soul Fixin' Man." Allison's guitar solo was delivered with forceful pop and the tonality of his Fender was quite accurate with all the shadings of his string-bending techniques. Read about the high points and low points of the Lawrence Audio Mandolin on Page 2.